Signs are going up around Mount Angel marking out historic locations on the city's Heritage Trail. The Heritage Trail is a 3.5-mile loop around Mount Angel's historic locations, many which date back to the 1800s. The city has been offering maps of the trail since 2016 and received $25,000 in grants to create signs for the trail in 2017. The grants included $10,000 from the Oregon Community Foundation, $10,000 from Marion County's Economic Development Grant program and $5,000 from HEAL Cities, an Oregon Public Health Institute campaign that encourages healthy lifestyles in Oregon cities (HEAL stands for Healthy Eating Active Living). The funding covered the cost of creating 10 signs, featuring landmarks such as the Mount Angel Abbey, Weissenfels Blacksmith Shop, the Saalfeld House, the Glockenspiel and St. Mary Catholic Church. The signs are being installed in two stages, so not all 10 have been put up yet, according to Mount Angel City Manager Amber Mathiesen. 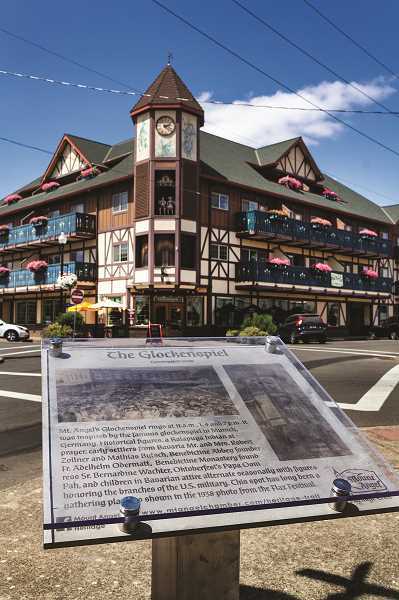 At least five of the signs have been put up, including signs for the Glockenspiel, Weissenfels Blacksmith Shop, the Saalfeld House, St. Mary Catholic Church and the Mount Angel Creamery. The tops of the signs are made of etched glass and were completed in 2017. They were unveiled at Mount Angel's 125th anniversary party in April. The bases for the second stage of signs were contracted out to Woodburn manufacturing company Gem Equipment, and are still being finished. The city is attempting to get all the signs up by Oktoberfest, according to Mathiesen. The Heritage Trail Committee and the city would like to eventually bring the total number of signs on the trail to 17.